Advanced electronics and software platform provide enhanced performance. From the moment you hit print, the 360 instantly gets to work. Full colour cards with HoloKote� print in just 18 seconds click-to-card. The Rio Pro 360 offers a wide colour spectrum so print is even more vibrant and colour rich � which on an ID card means a truer representation of the subject. The Rio Pro 360 can print an anti-fraud customised watermark on every card. 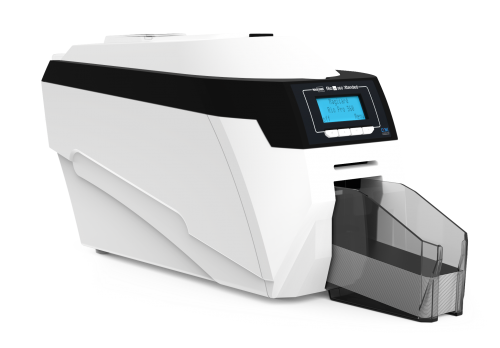 It enables the secure online delivery of up to ten bespoke HoloKote� watermarks. The Rio Pro 360 is backed by the best warranty in the industry. The fully comprehensive three-year UltraCoverPlus package includes no-quibble printhead cover and a hot-swap loaner service. 360 users will never be without their printer and always have full access to the global Magicard technical support team. Colour dye sublimation, monochrome thermal printing and rewritable technology. Colour: 18 seconds per card /200 cards per hour. Monochrome: 5 seconds per card/750 cards per hour. A HoloKote security watermark can be printed across the card surface. With the Rio Pro 360, this watermark can be customised to an organisation�s logo, or some other unique security design. LYNK enables the secure online delivery of up to ten bespoke HoloKotes to the printer through the driver interface. When used with HoloPatch cards, one area of the HoloKote watermark can be highlighted as a high visibility security seal. Magnetic stripe encoding: HiCo and LoCo ISO 7811, JIS2. Smart card encoding: Contact chip, MIFARE, DESFire and iClass. Others available. 3 years UltraCoverPlus with full printhead coverage and free loaner service - Available in North America, EU and other selected territories. Elsewhere a minimum of one year limited depot warranty. High Speed USB 2.0, USB 3.0 compatible - Type B, 10/100 Ethernet. 2x internal USB 2.0 (one host) - Type A. Windows XP, Vista, 7, 8, 10 (32 and 64bit) Windows server 2003 R2 SP2, 2008, 2012, 2016. Mac OS X 10.9.0 upwards. Linux with CUPS support. 470mm L x 220mm W x 300mm H / 18.5L x 8.6W x 12H including feeder and stacker. 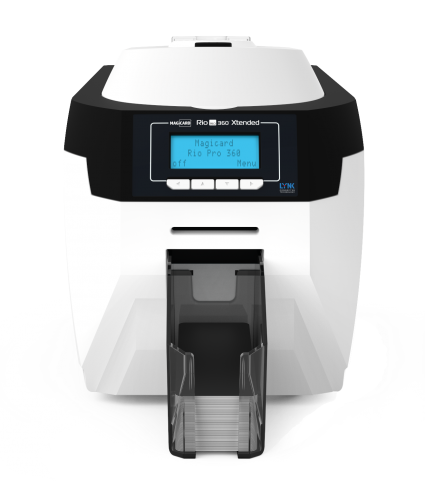 The Magicard Rio Pro 360 Single Sided ID Card Printer features a 3-year warranty on printer and printhead.